I like ice cream. I like ice cream a lot. And really, who doesn’t? Unlike many of you, my favorite flavor is a little bit more unusual. I don’t prefer chocolate, vanilla, or strawberry. No, my favorite is black raspberry. It doesn’t hurt that it also goes well with chocolate (sprinkles or syrup). There’s one disadvantage to liking black raspberry ice cream so much: it’s only available in the mid-Atlantic states. I have yet to figure out why exactly this is. The same brands that make black raspberry in Maryland don’t sell it in California (I’m looking at you Breyer’s). I couldn’t even find it in Upstate New York when I was in college. For a long time, black raspberry ice cream was one of those things that I made sure to enjoy when I visited my parents (usually, steamed crabs are one of the others). However, one of our wedding presents was an ice cream maker. This only solved half of my problem as I had no idea where to buy black raspberries. In fact, I had never seen one. But, perusing the frozen foods aisle at Trader Joe’s, I noticed they sold them frozen! I finally had the last part of the equation. And then the black raspberries sat in my freezer throughout the winter. Now that the warmer weather has come, I decided to indulge myself. And I can’t believe I waited this long. After dinner, I’ve taken to eating directly out of the container with a bit of chocolate syrup drizzled on top. The recipe I adapted from one for raspberry ice cream. It does come out a tad bit sour so it could use more sugar if you like desserts sweeter but that will decrease the prominence of the black raspberries. Served with chocolate syrup it’s pretty good as it is. Run the black raspberries through a food mill fitted with a disc with the smallest holes to create raspberry purée. Warm the milk and 1 cup heavy cream in a medium saucepan. Pour the cream into a large bowl with a strainer over top. 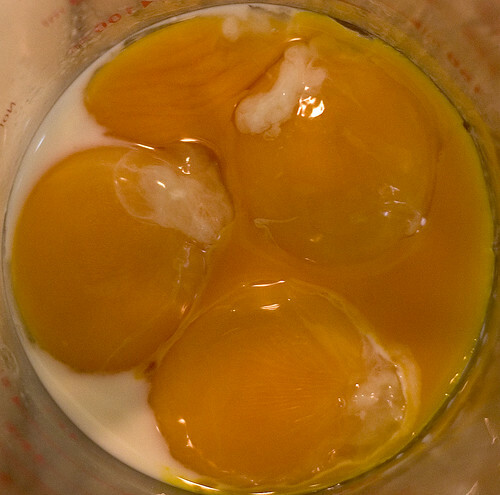 In a different bowl, whisk together the egg yolks. Slowly temper the warm milk into the egg yolks, then return the milk to the saucepan. Stir the mixture constantly over medium heat until the mixture because thick enough to coat the back of a spatula. Pour the milk-egg mixture into the bowl of cream via the strainer. Mix the raspberry purée and lemon juice into the bowl. Allow to cool and then refrigerate until cold. Mix in an ice cream maker according to the manufacturer’s instructions. Black raspberry ice cream in a sugar cone with chocolate “Jimmies” (aka sprinkles) is one of my favorite treats ever! You can get this flavor in New England too (where I live). Thanks for the recipe!! Anytime we went to Friendly’s when I was a kid I’d order exactly that. Unfortunately, I haven’t had this ice cream with sprinkles because we don’t have any. Thank you for the recipe! Black raspberry is my favorite, also. I grew up in the Midwest, but am now in CA and I agree – I can find raspberry ic, but not black raspberry. I’m going to make this today in my Cuis. 2-quart i.c. maker ;-))) Thanks again. Thanks so much for this recipe!!! Could you let us know the finished puree amount? We were processing a lot of black raspberries and I have concentrated juice, but don’t know how much to use in this recipe. I LOVE black raspberry ice cream. I also live in upstate NY (near Plattsburgh)and get it all the time. You may have to stray from national brands to get it… but we have it and it’s sooooo good! The recipe does not say when to add the sugar. Luckily, I remembered when the egg/milk/cream mixture was still hot and whisked it in. I added a splash of vanilla as well. It tastes great already. Well I live i the Eastern Panhandle of W.V., and I have to say that black raspberries probably aren’t sold in the stores here because they grow on bushes all along the roads and in most backyards. You do have to pick them every day or the sun will shrivel them up. My arms are covered with tiny little scratches right now from wading through bushes. Anyway I have never made ice cream with them. We have always just put them n a bowl with milk, sugar, and vanilla extract and put it in the freezer. You have to stir it ever now and then as the mixture freezes so the berries don’t all float to the top, and to break them up a little to swirl the juice around. But there are still many whole ones. It tastes wonderful and is easy. Also we make black-raspberry shortcakes. Those are wonderful. Just wanted to comment….am making this recipe because I am a transplanted East-Coaster (New Hampshire) who grew up on Black Raspberry Ice Cream, but I am now living about 30 miles south of Fairbanks, Alaska and cannot buy it here. I am working on putting the steps together and realized there are no instructions as to when to add the sugar! I am quite an experienced cook, so I am going to incorporate it into the warm milk/cream mixture so as to achieve maximum dissolving, however, I am curious as to when you add it since you have gotten nice reviews. By the way, I do enjoy your website and want to congratulate you on staying truest to the tradtional homemade ice cream recipes I grew up hand-cranking every summer of my life. Some things are just worth the work! Thank you and have a great day! I am from NJ and live in MI…everytime I come out to the Adirondacks, I buy Stewart’s Black Raspberry Icecream; its the creme de la creme!!!! I can’t stand that I can’t get it in MI…I dont like to cook, but will try the recipe….BUT a Big BUT, why not open up Stewart’s Icecream shoppe here in mid west…start with Grand Rapids, MI…PLEASE, Mr. Stewart’s; can you mail it in dry ice….I can’t stand it that I can’t have this delicious icecream!!! I want it please…HOW can I get the company to ship their icecream to Meijer’s Grocery Store…Inquire with Fred Meijer and family and send your selection…you will make big time money with this flavor…I know MI has it’s Hudsonville, Breyer, and other brands, but Stewart’s tops them all…please, Mr. Stewart’s inquire and see if you can spread the shipment elsewhere!! what a boost in the economy that would be for employees; trucks delivery, truck drivers, inventory, accounting, and stores local such as Meijer’s and Family Fare and D&W. I am also a Stewarts Black Rasberry lover. We used to live in Saratoga Springs NY but now live in Boise ID. No black rasberry here! Every time I go back I hit Stewarts even before I visit my friends. I have made delicious black raspberry ice cream by using a basic vanilla recipe and adding a jar of Smuckers’ Simply Fruit Seedless Black Raspberry Jam. It’s delicious. Add as much as you want to intensify the flavor and color. I’ve found this stuff in Maine my whole life…I don’t think it’s only available in Mid Atlantic states. Thanks for the recipe, though! This is way better than Breyer’s. I live in WI and I also crave the black raspberry ice cream that I’ve had where I’m from in PA. I just bought an ice cream maker and was sitting here wondering where I might find black raspberries. I’ve been wanting to try Trader’s Joes and for some reason haven’t made it there yet, so now all the more reason to get there! Thank you so much. Trader Joes has stopped carrying black raspberries nation wide. They weren’t selling enough. I did, however, find them today at Whole Foods. Just FYI. I also found this out. In the IL-MO area, they are carried at Dierberg’s…at $4.99 per 8oz bag! Yikes! I now live in MI and cannot find black raspberries anywhere to save to my life! i have just recently ordered some black raspberry puree off a site that sells ice cream ingredients and mixes hopefully this will be worth it when it gets here. I too have used the smuckers simply fruit but it is not what I am looking for flavor wise! why cant the famous blackberry icecream found in Adirondacks at Stewart’s be produced else where in this country….they would certainly not fail financially if they opened a factory right here in Michigan! Wouldnt this be great for employment status in this state who has the highest unemployment rate! I meant black raspberry icecream with no berries in it, but creamy style company open here in michigan. 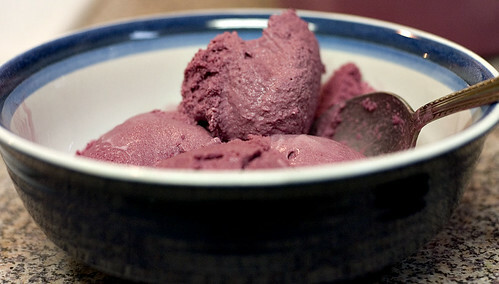 Weeks’ Dairy Bars in New Hampshire used to make black raspberry ice cream. But only in the late summer. It was AWESOME. I’m going to try this recipe. Back in 1986 I created a new ice cream flavor for Graeters Ice Cream in Cincinnati, Ohio. The flavor was Black Raspberry Chocolate Chip. It has grown in popularity to the point that it is now Greater’s #1 seller. It is now available nationally at Kroger Co. stores, and at other smaller supermarket chains like Market Basket, Whole Foods, Price Chopper, and a number of other stores. It is still made in small 2 1/2 gallon batches by hand and then hand packed in pints. It is currently retailing for about $5.50 a pint. As I have told many of my friends over the years, if you don’t like Black Rasperry Chocolate Chip ice cream, you probably need a taste bud transplant! I hope you try it and enjoy it. I used to get black raspberry often at Friendly’s–it was delicious. I have an ice cream maker, and made some raspberry ice cream, but it was missing something. Then I tasted someone’s blueberry ice cream, and it was very close to the Friendly’s taste! So I think mixing blueberry and black raspberry together might be the trick. Well, I live in Atlanta, Georgia and yes, I can get the Kroger brand, but Im from Pa and to me the Hershey brand is the best. Turkey Hill does not have enough black raspberry taste. We don’t have Friendlys here. Orlando has one, but that is an 8 hour drive. I love it, but that’s a bit far for a scoop! Thank you! Totally agree. Black Raspberry is the best and you just can’t find it in the Midwest! Does anyone else notice that he does not mention the one cup of sugar in the actual recipe? I am assuming you add it to the one cup of cream and milk to be warmed together….but the instructions completely leave out the sugar. 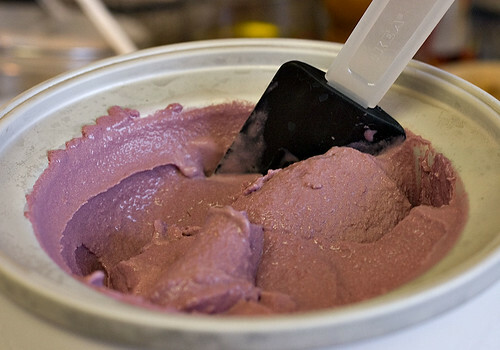 I first had black raspberry ice cream in 1970 in Queens N.Y. at a homemade ice cream parlor named Eddies.It was an incredible taste,and i still seek it out at homemade shops.I feel like we are the chosen ones to know this experience and appreciate it. 2013 is a bumper crop year for black-caps in Michigan. Our jam is all finished and we have a couple gallons of syrup left over. It’s the stuff USDA required meat inspectors to use as dye on meat cuts. Michigan was a major source of this dye when I was a kid. Should I assume this recipe should include the sugar in step 4? That would make sense but might darken the color a bit.